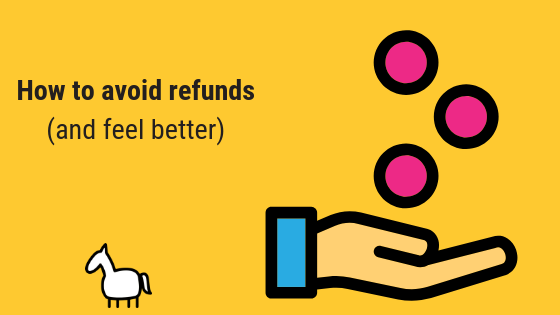 Can I tell you a surprising secret about refunds? Here goes: They make you angry. You will get personally angry or have some version of negative feelings. A seasoned coach told me that a long time ago, and I was initially surprised. But nope – he was right. This is most applicable if you are a private coach, but still applies across all business modalities. Choose great clients who fit your niche and coaching style. …most likely no one wins. You may not do a great job, or not deliver in the way that they want because it’s not your area. They may not be a great fit because again, it’s not your area. It *could* work out, because anything can work out. But why make it harder on yourself as a coach, and make the chance of getting a refund request higher? So instead, take your time with sales calls and email questions so potential clients know exactly what you do, and what you don’t do as a coach. And secondly, review your interactions with potential clients so you make sure they are a fit for your personal coaching style *before* they hire you. What this means is that you feel comfortable taking them on as a client, they seem to resonate with your style and philosophy as a coach, and you feel like they are ready to do the work. Don’t rush to help everyone, because ultimately that could backfire and really your hurt your bottom line. You could not only have to face a refund, but also a bad review or something worse! What about people who do group coaching programs like this one? Or run retreats, or offer online programs that are sold automatically? First off, don’t be afraid of scaring people away. Seriously. Or of being too bold or different. Frankly, you want people who aren’t a great fit for your style as a coach to eliminate themselves before they buy a program or service. You really only want people who are super excited to work with you, and feel connected to your style. These are the people who will make the best clients for you. First off, you be yourself. If you like bright or bold, be bright or bold. (Note: see this homepage as an example, and also this one – some people are going to hate these styles, and that’s okay! They will eliminate themselves as potential buyers, and therefore potential refunders). Own your niche – be clear about what you offer, and also clear about what you don’t. If you are a date coach who specializes with helping baby-boomer women learn to date online, and a 30-something comes along who is looking for relationship break-up advice, it’ll should be clear from your marketing and website that you don’t do that. Be clear. Own your space! If you don’t do relationship advice, say so! Put what you do in your marketing and talk about it endlessly so everyone knows who you really work with as as coach. And also be clear on your sales page or materials what isn’t included in any coaching programs or services. Clients will read your stuff and either like it and want more (and sign up!) or they will realize what they need most isn’t included and they will move on. That’s better for them and their growth, and also better for you and your business! In private coaching, this is usually handled in the client-coach contract. In online programs or evergreen programs, this is often handled in the website terms of service. Either way you need to have, in writing, your refund policy for your programs. Do people have a certain amount of time to get a refund? Can they get a partial refund if they’ve used part of the product or service? Think through these questions and write down your answers. It’s entirely up to you to decide what you feel is right, there is no real “wrong” answer here. 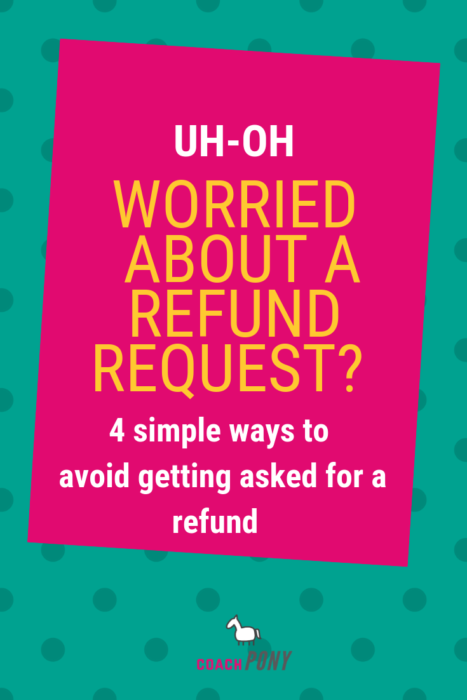 I have programs that have a no-refund policy (usually programs that have a retreat or physical component), programs that have a 30 day policy, and programs that have a 6 month refund policy. You can decide what works for you. If they know what they are getting into, it makes them less likely to refund in the future :). And now we come full circle. No matter how great a coach you are, or how carefully you advertise what you do, someone will sign up for your service who turns out not to be a great fit, and you will get a refund request. Why? Because coaching is personal, and it feels like your work isn’t good enough when someone asks for their money back. Have a great client onboarding system in place, so new clients feel safe and secure in their decision to buy coaching from you. Onboarding is how you welcome new clients to your products and programs, and often includes automatic emails and information that they need to succeed. This is an important coaching system we cover in BARB, if you are curious. But you can do it manually – just welcome new people via email or phone and make sure they have the right information to succeed. For private coaching this is often scheduling and contract information. For other programs it might be certain dates, or mind-set videos, or even password access. It just depends on the program. Have a great client care system in place. Client care is how you take care of clients. We strive to be awesome at it here at Coach Pony, but we aren’t perfect and I know we can always elevate our game. Clients who are upset will be quickly calmed by a fast, sincere response to their concerns or questions, and many will go from “thinking about a refund” to “I’m totally fine!” if you just take care of them like a real human. At its most simple, client care is just you responding to email thoughtfully :). At it’s most complex, it’s a systemized team response that you manage. And of course, there is hiring someone to help you with all of this, especially responding to customer requests, including refund requests. I have a great person who helps me with this type of thing, because it’s not personal for her, so she can remain calm and awesome in tough circumstances and handle clients who are stressed if something isn’t working in our programs. She also insulates me from those clients who – despite our best efforts to dissuade them from signing up because they aren’t a fit for our programs – decide to join us anyway, and end up feeling like they want something else so request a refund. Even after all these years I get annoyed by it because we work hard to make our style, voice and program descriptions very clear, and if I see a refund come through I still take it a little personally. Fortunately, because we work hard at all 4 steps in this blog, refunds in the Coach Pony/Rev Club world are pretty rare. And that’s the best place to be! So take an eagle eye to your business and see where you might want to implement one of these steps. Want to avoid pain, frustration, and being in a fetal position on your couch because your coaching business failed? Of course you do! 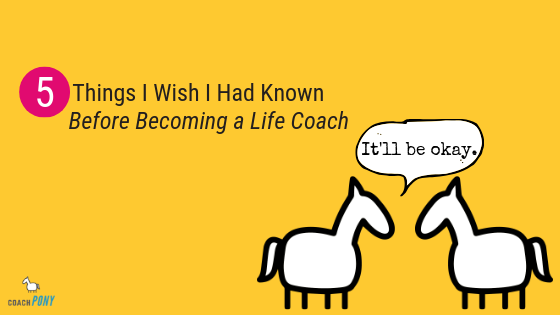 Here’s a 4-part series on why most fantastic new life coaches fail, and how to avoid all the mistakes! *No opt-in required, just click and go! This entry was posted in Coaching Lessons, Daily Operations, Sales Training on September 25, 2018 by Christie. 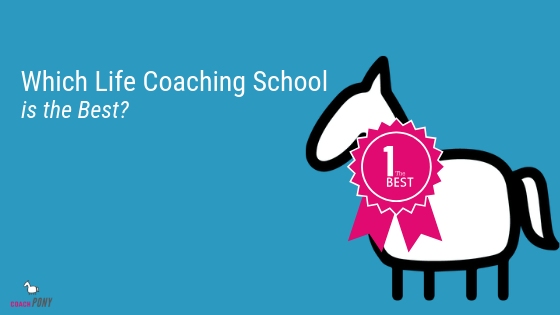 Which Life Coaching School is the Best?